Really? The Mangrove Killifish, Climbing Perch, and Snakehead Fish—and many others no doubt—would suggest otherwise. So how could our iconic genius say something so stupid? ...lines like the supposed Einstein quote above reinforce an idea that is actually quite dangerous to education generally: the idea that some people are just good at some things are some are not. This notion is anathema to education because the whole notion of learning is that you can, well, learn things. Contrary to popular belief, you don’t have to have a special “math brain” to be able to understand the Pythagorean Theorem. And you don’t have to be “good at English” to be able to write a decent analysis of Death of a Salesman. You just have to work hard and learn how to do it. I am inclined to agree with the good professor, even at the expense of my original idea that Albert Einstein—a refugee from Nazi book burning—may have been using some self-effacing fish-related Jewish humor to reflect on his experience with the stupidity and ignorance of his day. 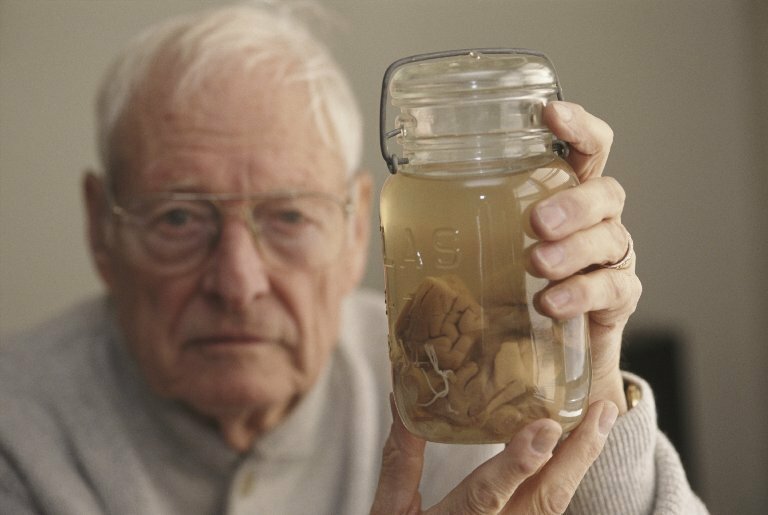 By the way, contrary to the outrageous assertion that a recently published photograph of Thomas Harvey—the pathologist who stole, sushied, and pickled Einstein's brain—depicts him holding a jar of gefilte fish is about as bonkers as the equally slanderous claim that the doctor was a closet eugenicist. BRAIN | A JOURNAL OF NEUROLOGY | The cerebral cortex of Albert Einstein: a description and preliminary analysis of unpublished photographs [PDF].